I gather links to my web pages related to statistics and quantitative literacy. They are discussed in the HKASME Mathematics Pedagogy Study Group meeting on Jan 30 and a workshop in CUHK on Feb 3. The use of TinkerPlots is particularly explained. These are links for my short talk in Apr 2013 during a CDI seminar in Kowloon Tong. How much junk math is there in your textbook? 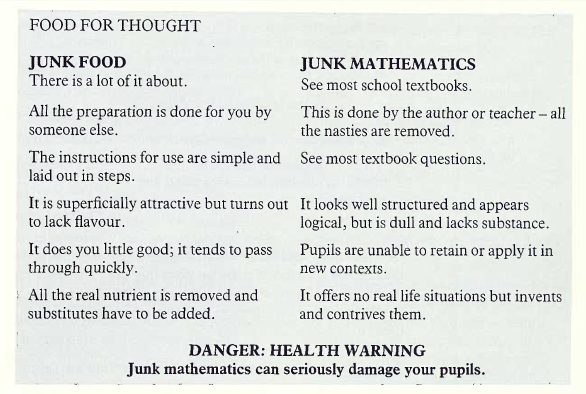 It is interesting to note how math in textbook is likened to junk food. This is read in an early report in England explaining what's wrong with common practice in teaching to low attainers in math. I believe the advice is still valuable for classroom teaching today and in HK. The report, Better Mathematics, published by H.M.S.O. in 1987, is now available in the National STEM Centre eLibrary [http://stem.org.uk/rx7ca]. The comparison above is extracted from p.15 of the report. That section describes the poor "mathematical diet for low attaining pupils". Nowadays, our textbooks and all sorts of ready made teaching resources look even more attractive, and can easily give an impression that you can have a lot to 'eat', but in fact nothing good for your health. Tasks based on story of giants provides very good learning opportunities for developing concepts of similarity and ratios (in linear, 2D and 3D measures). This is well documented in early studies in Realistic Mathematics Education. There are interesting learning activities designed for primary students' development of these concepts, building on their intuitive understanding. Here are two relevant papers (should be available via HKU library online). Streefland, L. (1984). Search for the roots of ratio: Some thoughts on the long term learning process (Towards... a theory). Educational Studies in Mathematics, 15(4), 327-348. By the way, two chapters from Newman (1956), The World of Mathematics (in vol. 2 and 4) gives interesting account of Gulliver's story from the view of mathematicians. 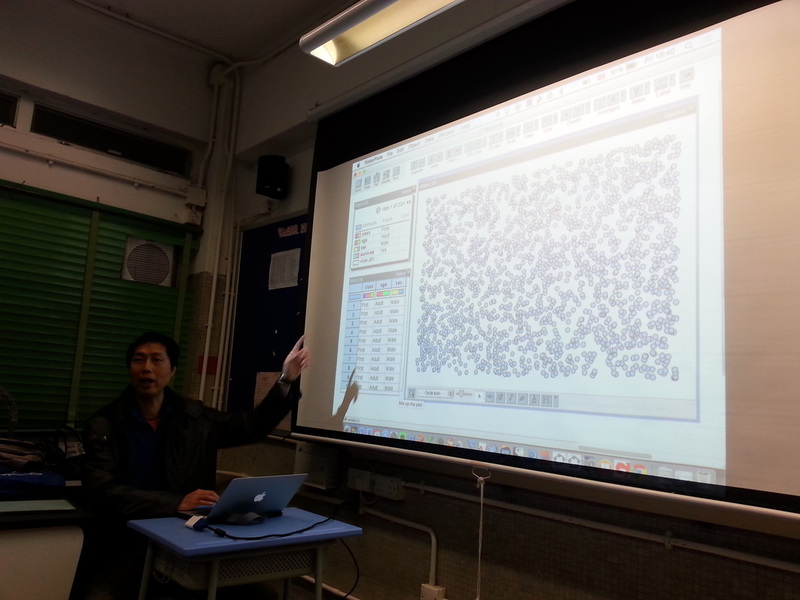 Just before X'mas, we have a discussion in PGDE class on learning about ratios in similar 3D figures. Apart from computational practice on pure geometric figures, there should be realistic contexts where intuitive consideration of ratios in different dimensions naturally arise. 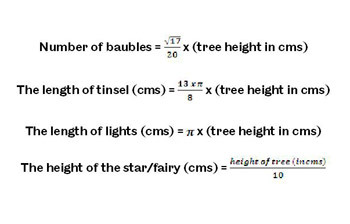 It makes me think of the festive formulas recently encountered in Treegonometry, the math for X'mas tree decoration. This set of formulas is derived by students from the University of Sheffield. It's interesting to me that the number of baubles does not seem to vary with the surface area of the tree. A quick search on web shows a few critical reviews including comments along this line. Is There a Formula for The 'Perfect' Christmas Tree? Deck the halls with tau of holly, formula-la-laaa! Check my photo album in Evernote shared folder. These are selected photos from the album.